JAKARTA, Indonesia (CNN) -- Indonesian forces says they have killed the country's most-wanted terror suspect in an overnight raid, dealing a major blow to an al Qaeda-linked network blamed for some of Southeast Asia's deadliest terror attacks. The body of Noordin Mohamad Top, accused of masterminding attacks in Indonesia by the Jemaah Islamiyah extremist group, was identified by police. "The fingerprint has been verified by the police hospital," said Indonesian police chief, Gen. Bambang Hendarso Danuri. "It's a blessing from God in this holy month (of Ramadan)." The overnight raid in central Java comes two months to the day after suicide bombs ripped through two hotels in Jakarta, killing seven people and wounding dozens of others. Noordin Top claimed responsibility for the July 17 attacks. His terror network is blamed for nearly every major terror attack in the southeast Asian nation over the past decade, claiming the lives of more than 200 people. "This is a huge advance in Indonesia's fight against terror," said Sidney Jones, a senior Asia adviser for the International Crisis Group, a global nonpartisan advisory organization. But she warned that Indonesia's terrorism fight does not end with Noordin's death. "We still don't know the extent of the network and the funding source of Noordin's network," Jones said. Noordin, 41, was reportedly an officer, recruiter, bomb-maker and trainer for a small splinter group of the militant organization Jemaah Islamiyah, which has ties to al Qaeda. The FBI in the United States added Noordin in February 2006 to its list of 10 suspected terrorists who have not been charged in the United States but are wanted for questioning. There were reports last month that the Malaysian-born terror leader was killed in a raid, but it turned out to be one of his associates. This time, Indonesian authorities say they are certain that they got their man. Police learned of Noordin's whereabouts after apprehending and interrogating two terror suspects on Wednesday. Anti-terror forces launched their raid in the Kepok Sari neighborhood of Surakarta in central Java around midnight. It ended after a five-hour standoff capped by a firefight. Also killed in the raid were Urwa and Aryo Sudarso, two of Noordin's key associates. Urwa was convicted in the 2004 bombing of the Australian embassy, but was later released on probation. 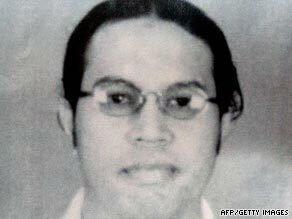 Aryo Sudarso was an apprentice of Azahari bin Husin, believed to be one of the masterminds behind the Bali bombings in 2002 and 2005. Husin died in a shootout with security forces four years ago in East Java. The owner of the home where the standoff took place was also killed, and three others were arrested. Authorities found weapons and eight bags of explosive materials inside the home following the operation, according to a police spokesman. Authorities have hunted for Noordin for years, accusing him of involvement in July's twin suicide bombings at the Marriott and Ritz-Carlton hotels in Jakarta, the 2002 Bali nightclub bombing and attacks on the same Marriott hotel in Jakarta in 2003, as well as the Australian embassy in 2004. A handful of suspects that authorities have linked to Noordin's network have been on the run since the July bombings. "It's a great day for Indonesians and a great day for the international fight against terrorism worldwide," Djalal said. He agreed that Noordin's death does not mean that the fight against terrorism is over in Indonesia. "I think they are on the defensive now because of the raids that happened today." CNN's Andy Saputra contributed to this report.